The Turnbull Government has only one policy — to punish the poor and advance the affluent, writes managing editor Dave Donovan. THE TURNBULL GOVERNMENT has been in power for near 18 months. It appears to have only one agenda: to punish the underprivileged and impoverished, increase inequality, and pump up and promote the prosperous and powerful. And so, last week, we saw a decision that cuts the penalty rates for hospitality, retail and fast food employees — some of Australia’s lowest paid workers. This decision, of course, was not made directly by the Government, but by its supposedly “independent” Fair Work Commission. But it was a move energetically lobbied for by just about every Coalition MP since Turnbull took over the country in September 2015. The Commission knows which side its bread is buttered on — and how to knife the sandwich makers. In a same month Turnbull took power, a whole sinking raft of Government MPs, including Employment Minister Michaelia Cash, took to the airwaves to encourage the FWC to slash weekend penalty rates for low paid workers. After Resources Minister Josh Frydenberg says Sunday penalty rates "need to be looked at" on Sunday, and Liberal MP Andrew Nikolic agreed, Senator Cash said penalty rates "certainly seem to deter weekend work". Mr Turnbull on Tuesday described the Sunday penalty rate, which is double a regular hourly wage compared to the Saturday time-and-a-half rate, as a hallmark of the old economy. "The only reason they're different, I assume, is history," Mr Turnbull told Melbourne radio 3AW. "I think over time you will see a move to a more flexible workplace the transition to that …" Mr Turnbull said before host Neil Mitchell interjected: "It's a seven day economy isn't it?" "Of course it is," the Prime Minister agreed. And this has been the narrative ever since. 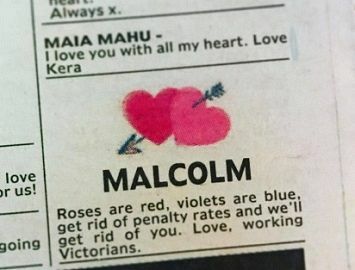 Indeed, cutting the wages of hospitality and retail workers has been one of the only consistent themes from two-hundred-millionaire Malcolm. This is the same sort of thinking that sees the Government keep on sending out debt notices to former welfare recipients to claw back fictitious debts. “When a notice is issued and it appears to the person to whom the notice is issued a mistake has been made, they can contact Centrelink and sort out the problem,” Brandis replied, which was met with roars of laughter. Q&A host Tony Jones quipped: “If they can get an answer”. She then asked audience member Fred Thorpe, who lives on a $22,000 disability support pension, how long she had waited on the phone. “Two weeks every day for one-and-a-half hours a day to make that call,” Ms Thorpe responded. This is the same Government that still – in 2017 – is trying to push through Parliament the same malignant Budget cuts it has been unsuccessfully trying to impose on poor people since May 2014. This time around, it has been trying to do it by attaching this unappetising electoral poison to some more popular measures in an all-or-nothing so-called “Omnibus Bill”. The Turnbull team even had the callousness to try to make the funding for the national disability insurance scheme (NDIS) contingent on the passing of the bill. This led Opposition Treasury Spokesperson Chris Bowen to quip recently that Turnbull had tried to “throw Morrison under the omnibus”. The Omnibus Bill was itself thrown under a bus last week (Thursday, 23/2/17), after The Australian reported One Nation leader Pauline Hanson had removed her support for it, saying single women would “get themselves pregnant” in order to access paid parental leave. Meanwhile, the Government continues lobbying for tax cuts for corporations, including the biggest and most profitable companies in the entire nation — the almighty banks. And any suggestions banks could be quarantined from tax cuts was brusquely dismissed by former Goldman Sachs investment bank executive Turnbull. Unfortunately for Malcolm, this is just a bald-faced lie. In truth, Australia has one of the most complicated tax systems in the world, with different sectors treated differently right throughout. Primary production, the film industry, and petroleum resources are just a few of the “sections” that have different “practical” taxation measures. It’s not at all that not cutting tax to banks is not practical, it’s just that Turnbull doesn’t want to do that. Constraining the powerful, you see, cuts right against his character. Which is why he also steadfastly opposes every move to make the banks face a banking royal commission. “... royal commission would not result in any action." Not if he has anything to do with it, at least. It is inescapable. Promoting the powerful against the interests of the puny is Turnbull’s central concern. This was gloriously exemplified just last week, with Turnbull courting and carousing with war criminal, thug and tyrant Bibi Natanyahu in Sydney and its surrounds. Last week, Netanyahu had the audacity to attack, not one, but two former Australian prime ministers − Kevin Rudd and Bob Hawke − for simply advocating for a two-state solution — a homeland for not only the Jewish people, but also for the people they dispossessed in 1948. Did Turnbull defend his predecessors or stand up for the almost powerless Palestinians? Mention them at all? He didn’t say “to hell with the weak”, but his message was loud and clear; the defeated are to be despised and to the victors the spoils. This editorial was originally published on 24 February in the Independent Australia subscriber only weekly newsletter. Subscribe to IA for less than $5 a month.